Our black-footed cat female Diva clearly is heavily pregnant. The way she looks we don’t have to wait much longer, so fingers crossed that all goes well. The other female Beauty already gave birth to a kitten two weeks ago, and so far all is fine and she is taking good care of it. We’ll keep you up-dated! 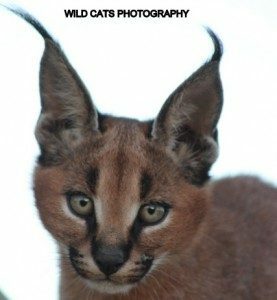 Wild Cats World & Cat Conservation Trust proudly present!!! Though it is still early days and too soon to sheer, we just couldn’t wait any longer to share this wonderful news with you. One of our Black-footed catfemales, Beauty, living at our working alliance for the black-footed cats (a.o.) gave birth to one kitten on Wednesday night, October 15, 2014. 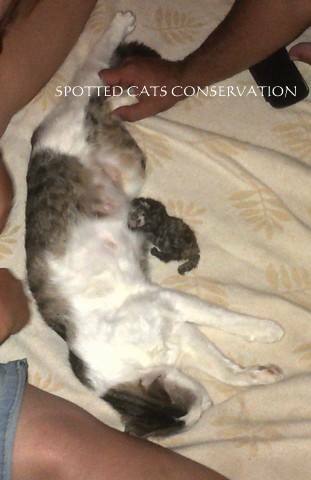 So still only 9 days, but up till now Beauty is taking care of her kitten in a great way. As said it is still early days, esp. for the rare Black-footed cat kittens, but all in all it is wonderful news. Our one male Blacky of course is the proud dad to the kitten. He is now with his other female Diva, who if we are lucky is about to deliver soon too. Keep them in your prayers and fingers crossed that all goes well. It would be so great for this endangered species (both in the wild and in captivity). 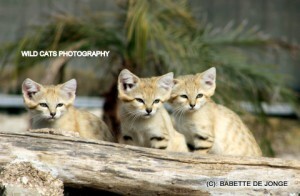 We in WCW know that if they will make it anywhere they have the best chance at Cat Conservation Trust!! 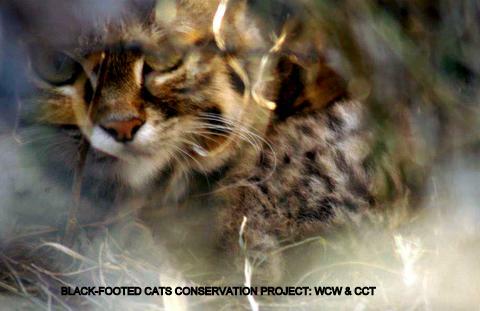 Also see Back footed cat conservation project. 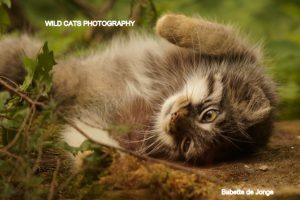 Wild Cats World did a small “Tour de France” on kind invitation by Parc des Félins and Zoo de Maubeuge, to talk about (wild) cats conservation. The park is of course the dream of every wild catlover, as for space and species, while Maubeuge showed us how it is possible to provide an enriched life to the animals with little means and space. Of course we kindly accepted to see the Sri Lanka leopardcubs with their (very protective!) mom, a special birth for the species and for a small park like this. As for the sandcats (felis marguerita) we discussed the possibility to start with this gorgeous species at our WCW SA project. 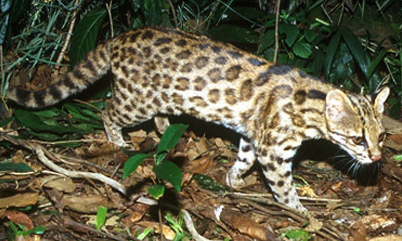 It would be great to have this species next to the Black footed Cats, the two smallest African wild catspecies. More about this later at a later stage. For now enjoy this photo and many more that will follow! 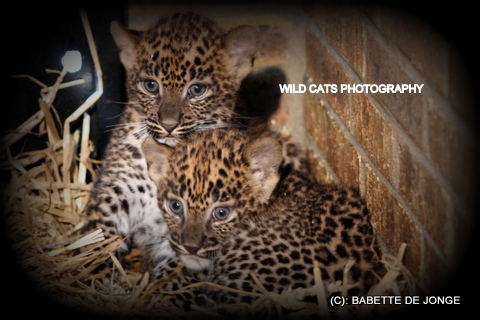 Sri Lanka leopard cubs, endangered subspecies of the leopard (panther). We were kindly invited to get a first glimpse of the 6 weeks old cubs at Zoo Maubeuge, the first successful litter of Sri Lanka leopard cubs of 2014 in the world-wide breeding program. The leopardmom was very protective and was hiding the cubs in the straw so it was very difficult to get a glimpse and eventually a good picture. Aren’t they cute? On 15 March 2014 the world united in a Global March for Lions. The March against Canned Hunting. These photos are taken during the participation (read: joining the march against Canned hunting) of Wild Cats World in the Amsterdam-March to give you all an impression of a very successful day, with many thanks to foundations Four Paws, SPOTS & WAR International for the organisation of this march. All participants support the call on our governments to BAN the deplorable Canned Hunting Industry. We will raise awareness to educate the rest of the world regarding every stage of the life-cycle of torture of a canned lion – the world needs to know and stop supporting the cub-petting and walk with lions experience – the first steps of untold misery for cubs ripped away from their mothers soon after birth. The fraudulent luring of ignorant volunteers who pay for the “privilege” to “care for” the cubs – all destined to be killed in an enclosed camp where they will have no way of escape. Often shot numerous times to prevent “spoiling” the trophy with a shot in the head, which will be mounted on a foreign wall and the bones exported to Asia for bogus medicine – all for top dollar. Many supporters did join the march for the lion (and other victims of this ugly killing business) against CANNED HUNTING! In 24 hours the world lost 2 fighters: a great human being, Nelson Mandela (“Madiba”) but also our tiny little black-footed cat kitten. The surrogate (domestic) mothercat did an excellent job and the first days the weight increased but sadly the last 2 days he got it bad and stopped drinking. Beauty gave birth to this kitten, a male, and to a second still born. She sadly didn’t take care of the kitten the first day, as she was still in labour. That’s why we decided to give it a go with the domestic mothercat, a much better option than bottlefeeding. The bond between two got closer, and also when the little one wasn’t feeling well the mothercat licked him and gave him comfort. This afternoon he passed away, but we didn’t want our firstborn to die without a name, so we thought Madiba was the perfect name for our little fighter, to honour him and also the icon Mandela. May they both rest in peace and find the road to freedom….forever!!!!!! I have walked that long road to freedom. I have tried not to falter; I have made missteps along the way. But I have discovered the secret that after climbing a great hill, one only finds that there are many more hills to climb. I have taken… a moment here to rest, to steal a view of the glorious vista that surrounds me, to look back on the distance I have come. But I can only rest for a moment, for with freedom come responsibilities, and I dare not linger, for my long walk is not ended! 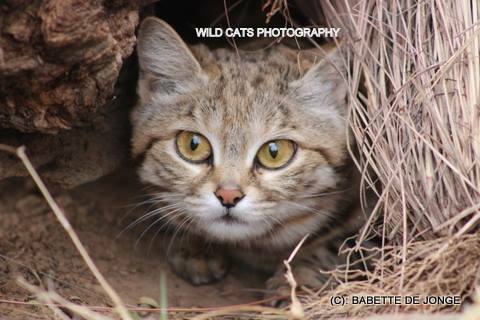 Black footed cat Beauty gives birth! DNA tests have revealed a new small wild cat species!